The album may or may not be obsolete, but the fact remains: Listeners have long obsessed over individual songs. The Single File is The A.V. Club ’s look at the deep cuts, detours, experiments, and anthems that make us reach for replay. When Steve Coogan, playing Factory Records founder Tony Wilson in Michael Winterbottom’s 24 Hour Party People, authoritatively proclaims, “No band ever survives the death of their lead singer,” he offers it as a generally accepted rule with one specific exception: New Order. Ian Curtis’ suicide shortly before the release of Joy Division’s second album, Closer, and first North American tour is one of the great “what if”s in rock history. What Bernard Sumner, Peter Hook, and Stephen Morris did afterward, regrouping and forging a new direction, remains an improbable rebirth. And the song that best epitomizes that tumultuous, grief-stricken process is “Ceremony,” New Order’s debut single. At the time of Curtis’ death, Joy Division had been rehearsing new songs, including “Ceremony,” which made it into the band’s live show on a number of occasions. When Sumner, Hook, and Morris reconvened, they were left with “Ceremony” and “In A Lonely Place,” songs Curtis had contributed to but hadn’t yet been released in any official capacity. Those songs were Joy Division’s unfinished business, the last remaining work to be done before any symbolic forward progress could be achieved. Three recorded versions of Joy Division’s “Ceremony” exist. The first, a live version, appears on Still, the 1981 compilation album that contains previously unreleased material and a recording of the band’s final show at University Of Birmingham’s High Hall from May 2, 1980. The second is a studio rehearsal take—recorded in Prestwich, at a space listed as “Graveyard Studios”—from four days before Curtis’ suicide, and it appears on the Heart And Soul box set. The third, a fan-recorded sound check take from the afternoon of the High Hall show, exists only as an online bootleg. Listening to any of those three versions is a cryptic exercise in grasping at an unattainable past. Curtis’ alternately quavering and soaring screeches are so low in the mix that his lyrics—which shift widely between the recordings—range from muffled to entirely unintelligible. Only the back half of the High Hall recording from Still contains a clear vocal track, leaving at most one incomplete version. Bitter fans have long blamed errors by recording engineers or live mixers for failing to preserve even one pristine Curtis vocal track among these opportunities. But in terms of symbolism, it’s grimly poetic that Curtis sounds as though he’s lost and fading away from the rest of the band over the course of each take. “Ceremony” was a song Curtis was still working out—hence the shifting lyrics—and the hanging thread of the incomplete recordings gave the remaining members a foothold to hang on to as they regrouped. Closer was released in July 1980, and the rest of the band took nine months to put out a re-recorded version of the final two Joy Division tracks, in part as a tribute to Ian Curtis’ memory. Over the course of that time, each of the three remaining members tried out as lead vocalist. A New Order demo session from September 1980 at Western Works in Sheffield contains a full recording of “Ceremony” with drummer Stephen Morris as lead vocalist. It’s arguably more haphazard that any of the Joy Division recordings, as the fledgling band struggles to work out a new identity. Eventually, guitarist Sumner emerged as the new vocalist, and Martin Hannett, Joy Division’s frequent producer, was again behind the console to work on what would become New Order’s message to the world that the band wasn’t finished yet. The March 1981 single version contained both unfinished Joy Division tracks, sealing off that catalog and providing Sumner, Hook, and Morris with a blank canvas. 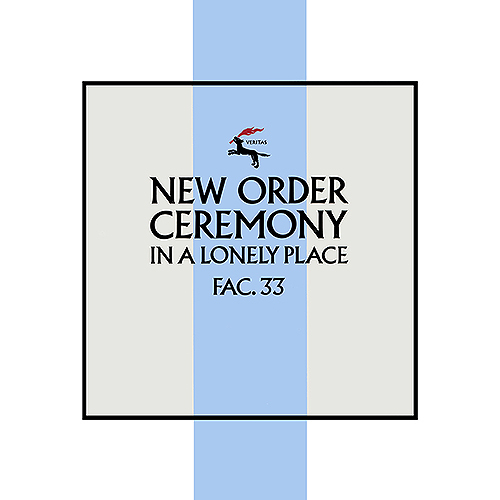 On this version of “Ceremony,” just like the Joy Division versions before it, the drums punch and echo, the cymbals are high in the mix, and are matched only by Hook’s high bass line. Sumner’s vocals are awash in reverb behind the instrumentation, a tentative foray into singing Curtis’ words, which required putting those three demos—specifically the Graveyard Studios take recorded in the same session as “In A Lonely Place”—through a graphic equalizer to decipher. Though the single was commercially released, the lineup of New Order had yet to be solidified, and that lingering instability carried over into the March 1981 single version, recorded at Easter Artists Recording Studio (E.A.R.S.) in East Orange, New Jersey. New Order still sounds manic and unpolished, yet airy and dreamlike, caught between the fierce post-punk of Joy Division and something waiting just around the bend. To round out the lineup, on the advice of longtime manager Rob Gretton, they asked Morris’ then-girlfriend Gillian Gilbert to join on guitars and keyboards. Until Gilbert joined the band, Sumner, Hook, and Morris were simply the remaining members of Joy Division. With her, as evidenced by the 12-inch re-release of “Ceremony” recorded in September 1981, they became New Order. Debate can rage on about whether the March single is better, or whether the Joy Division originals would have been the best had Curtis’ vocal tracks remained unmarred. (A 2011 Record Store Day re-release of New Order and Joy Division versions of “Ceremony” and “In A Lonely Place” on opposite sides of the same record only added fuel to that fire.) But the final one with Gilbert should be considered the definitive version of the song, because after frantically searching for a foundation without a talismanic leader, and rotating through the remaining members in search of a new voice, it’s the sound of a newly complete whole settling into place. Whereas the Joy Division takes and earlier New Order attempts at the song still radiate bits of chaos, this final version projects a calm demeanor right from the start. Peter Hook’s notable high bass line floats over the top, Morris’ drums echo through the studio atmosphere. The tempo is slower, but the rhythm is no less insistent than on “Transmission” or “Love Will Tear Us Apart.” And once the second guitar line kicks in, the picture is complete. Where once there was a trio written off to the footnotes of history without Curtis, there is now a quartet taking the first step in a new direction. The band has always been prickly when asked about the meaning of lyrics in its songs. (The final line of “Your Silent Face” on Power, Corruption, & Lies addresses this directly: “You’ve caught me at a bad time / So why don’t you piss off?”) Still, it’s hard not to read most of “Ceremony” in light of the turbulent year following Curtis’ death, especially the final lines of the last chorus, “Picture me and then you start watching / Watching forever / Watching love grow forever / Letting me know forever.” The guitar line keeps lilting, and Sumner’s voice repeats “forever” as his vocals fade into the mix, and New Order achieves a small piece of sonic catharsis. In the end, Steve Coogan’s Tony Wilson was probably right in his summation: Joy Division is yet more proof that band’s do not survive the death of a lead singer. But the recording history of “Ceremony”—from the sketchy studio rehearsals, to the live takes, to fledgling experiments after Curtis’ death, to the multiple official singles—positions New Order as a band building on Joy Division’s legacy, but with a separate and alternately influential style all its own. via “Ceremony” bridges the gap between Joy Division’s end and New Order’s start · The Single File · The A.V. Club.